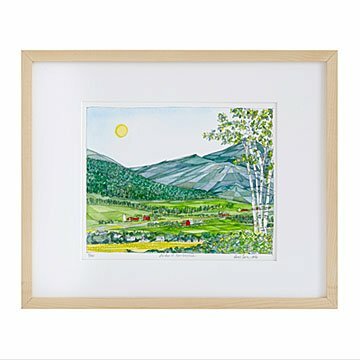 Bring the beauty of New England to your home with this unique watercolor of a hiker's-eye valley view. The sun shines down on the fertile farmland and rolling hills of Maker Renee Leone's New England valley watercolor. Slim and sturdy birch trees in the forefront frame a hiker's-eye view of the barns and silos along the mountain-fed river, bringing a touch of pastoral appeal to your home. This intriguing geometric art piece is finished with a blonde maple frame, complementing the summery green and blue palette. Renee creates a visual travel journal of iconic natural sceneries, which are hand signed and numbered prints in a limited edition of 250. Print made in Chicago. Frame made in the USA. Check out Renee Leone's other Regional Tree prints: Desert Cacti of the Southwest, Redwoods of the West Coast, Maples of the North Atlantic and Aspens of the Rocky Mountains. The stained hardwood frame is maple; the black frame is BonanzaWood®. Both frames are made in America. The unframed option is not matted.